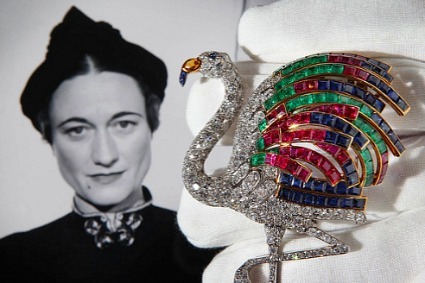 Jewel of the Month November 2010 is the magnificent Wallis Simpson Flamingo Clip; one of a suite of jewels and precious objects of the collection of the Duchess of Windsor, which were auctioned by Sotheby's on the 30th November 2010 in London. The jewels and cherished objects retold the Wallis and Edward love story in a most poignant way. Jewel of the Month November 2010 broach is designed as a flamingo in characteristic pose. The plumage is set with calibré-cut emeralds, rubies and sapphires. The beak is set with a cabochon citrine and sapphire. The eye is set with a similarly cut sapphire. The head, neck, body and hinged legs are pavé-set with circular brilliant and single-cut diamonds, measuring approximately 95 mm x 65 mm x 22 mm. It is signed to the clasp MONTURE Cartier and indistinctly numbered, French assay and maker's marks. 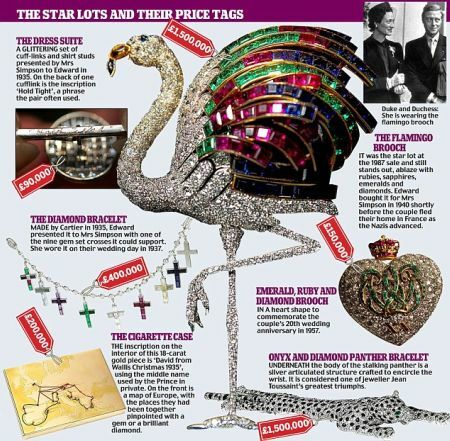 Read more in the Sotheby's PDF about the exceptional jewels and precious objects that were part of the Duchess of Windsor collection for auction in London. The Jewels represent the exquisite taste of the Duke and Duchess and also memorialise key events in their relationship. The Duchess's inclination for fashion and the Duke's appreciation for quality, design and color gave their collection a theme that is recognizable throughout its span. Jeanne Toussaint, Director of Cartier High Jewelry in 1933, a woman of imagination and exquisite excellence, and nicknamed the "Panther" by Louis Cartier, created the multi-jeweled Flamingo Clip and was also involved in the creation of the famous wrap around diamond and onyx Panther bracelet, (which was also auctioned in the same lot and can be viewed on the above YouTube). Every new idea had first to be submitted to Toussaint's merciless judgement. Mounted by Cartier, the Flamingo Clip was designed by the Jewelry designer, Peter Lemarchand. The Duchess of Windsor is known to have worn the Flamingo brooch soon after acquiring it. She was spotted wearing it while accompanied by the Duke, as they arrived at the Ritz Hotel, Madrid, on his forty-sixth birthday on 23rd June 1940. [Michael Bloch, Operation Willi, 2nd p. of photographs after p.82].